Categories are used to organize products displayed in eBay. An example would be “Fashion” as the broader category and “Women” as the more specific category. Choosing the best category and sub-category for your products will help customers find your products. In SureDone, you must choose a category for your product to be successfully listed to eBay. 1. 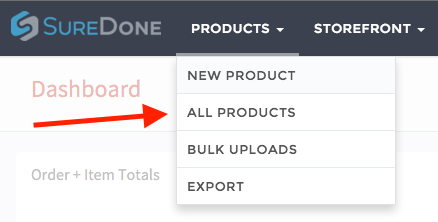 Go to the Editor and choose one of your products by clicking edit, or in the case of a new product, click Add Item. 2. Once in the item, scroll down to the eBay Section. 3. In the search box beside the Category ID field, enter keywords to find an eBay Category and click the search button. A drop down field will appear. 4. Now, click the Choose Category drop-down and pick the Catgeory you’d like your product displayed in. 5. Once you are completely done, click “Update” at the bottom of the page to save your work.